For investors to gain wealth at a rate that exceeds the growth of U.S. business, the percentage relationship line on the chart must keep going up and up. If GNP is going to grow 5% a year and you want market values to go up 10%, then you need to have the line go straight off the top of the chart. That won’t happen. The reason it won’t happen is because it’s impossible for the growth in the price of a company’s stock to outpace the company’s earnings forever. This can happen for a time, to be sure. But it cannot last. One of the basic laws of investing is that the price you pay should be determined by the expected future cash flows. Hence, stock prices tend to grow in tandem with productivity. This is a relationship that, in all sane market conditions, is the primary factor in determining value. Investors who buy or sell securities without this information in mind are not really investing. Rather, they are speculating (i.e. gambling). Buffett made a point of emphasizing the importance of quantification. When investors make prudent, long-term oriented decisions based on quantifiable metrics, they are likely to neither “rise to brilliance” or “sink into craziness”. But what happens when investors ignore long-term quantifiable metrics? They may just make the stock market rise to craziness. Below is a graph that shows the total value of US publicly traded securities as a percentage of GNP. The blue line is using the Wilshire 5000 index to value US publicly traded securities. The red line is using the Federal Reserve’s own measure. However, regardless of the data you use, the message is clear: US stocks are expensive. The chart at Advisor Perspectives has the Market Cap to GNP at only around 150% in 1999. It’s likely that Buffett was using a slightly different measure of market capitalization, which made the percentage higher. Regardless, Buffett’s warning is just as prescient nearly 17 years later. 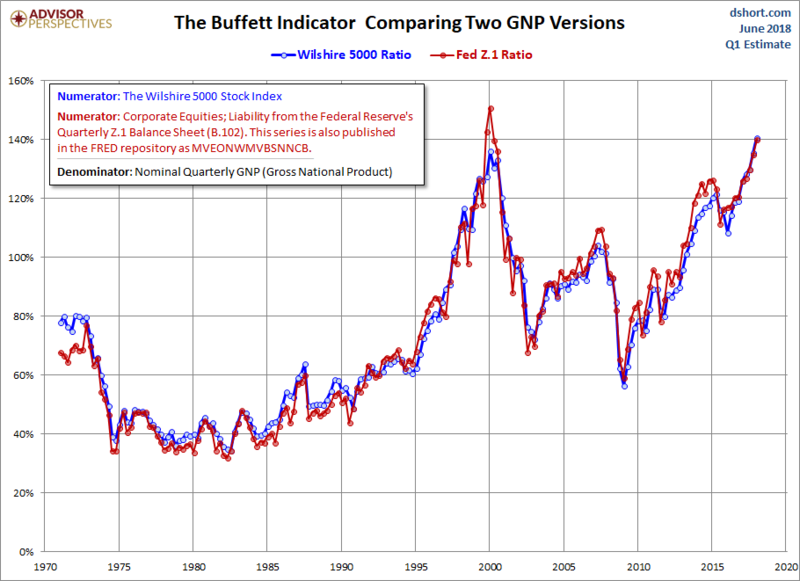 The Buffett Indicator went from a high point of 150% in 2000 to a 2002 low at around 75%. As Buffett said, this was a good time to buy. They subsequently rebounded and rose to around 110% in late 2007. Then their values declined to below 60% at the bottom of the bear market in 2009. From that point, with the help of experimental central bank inflationary policies, they have risen to their current level at over 140%. At over 140% market cap to GNP, the US stock market is clearly overvalued. Like, insanely. The extent to which it may go higher (as it did temporarily in the late 90’s), or abruptly fall (as it did in 2000 & ’07), is difficult to say with precision. When the wave of investor sentiment is towards craziness – in the name of brilliance – the short-term results are rather unpredictable. Riding this wave higher – as nearly all investors are currently doing – is going to work well. That is, until it doesn’t. And at that point, it’s already too late (or emotionally difficult) for most investors to make the necessary portfolio adjustments. They have already been burned. At Plan Financial, we aren’t running for the hills or selling everything. However, we are using quantifiable metrics in order to position our clients to be successful. Our goal is not to “rise to brilliance” in the eyes of those who are likely to “sink into craziness”. Rather, we make quantifiably good decisions in order to help our clients accomplish their objectives. If your advisor isn’t talking like this, then it’s likely you hired a speculator who likes to play with fire.